Originally posted on 7 February. Scroll down for news of the commercial release. Side Effects Software has unveiled Houdini 16, a major update to its procedural 3D software, overhauling the UI, adding a new autorigging sytem, and new destruction, fluid simulation and terrain-generation options. The release, which is due to ship on 21 February 2017, also marks a change in branding and pricing for the software, with the base edition being officially renamed ‘Houdini Core’. At the Houdini 16 launch event, which took place in London last night, Side Effects president and co-founder Kim Davidson described the update as “our largest and most cutting-edge release to date”. Even more so than with previous releases, that means not just playing to Houdini’s strengths, but a deliberate effort to broaden the software’s appeal beyond its traditional user base of effects TDs. As well as a new audience of games artists drawn to the software through Houdini Engine, that seems to mean disaffected Autodesk users: at one point in the evening, VP of product development Cristin Barghiel referred to a “community needing a new home”, which it’s hard not to read as ‘former Softimage artists’. Accordingly, as well as a strong set of new simulation tools, Houdini 16 reflects the result of ongoing, multi-year efforts to revamp core toolsets like modelling and look development. 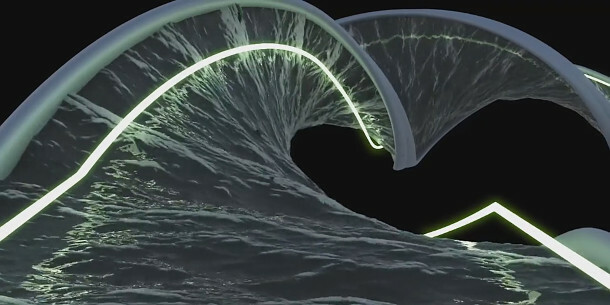 For dedicated Houdini-watchers, some of the key features in version 16 – codenamed ‘Amarok’ – will come as no surprise, Side Effects having previewed them in a roadmap video it released last year. 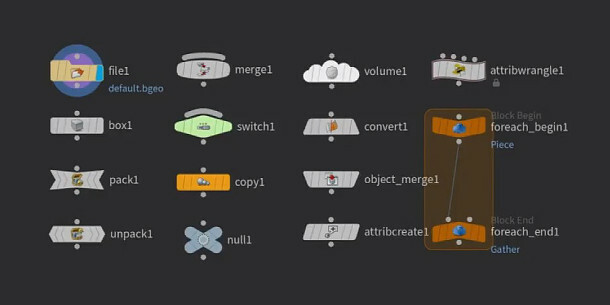 That includes the changes to the user interface: in particular, a ground-up rewrite of the network editor used to construct and edit the node networks central to Houdini workflow. Side Effects describes the aim of the work, which has been carried out entirely in Python and Qt, as “crazy performance, mad customisability, [and making the new editor] a joy to use”. As well as colour coding, nodes now have shapes reflecting their function, as shown in the image above, making it easier to interpret complex networks at a glance. Compositing networks also now include thumbnail previews showing the output of each node visually. There are also some neat usability features that weren’t shown in the original preview, including a new bookmarking feature, and the option to reshape the connections between nodes by placing ‘dots’ – think of adding extra points to a curve – to tease out tangles of wiring. Mousing over a node in the network editor now brings up a radial menu showing the inputs to that node, making it possible to interact with it even when zoomed right out in the network view. It’s a change reflected throughout the software, with new Maya-style context-sensitive radial menus – which, to judge from the latest demos, have evolved considerably in design since the original preview. The update also brings several changes to Houdini’s modelling toolset: most notably, a rather nice-looking new real-time Booleans system, which you can see at 00:50 in the video above. Boolean operations preserve materials and UV attributes, and according to Side Effects, work interactively with base objects running to many tens of thousands of polygons. 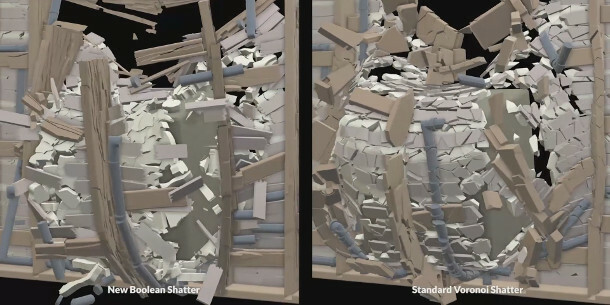 The functionality has also been integrated with Houdini’s other toolsets, opening up interesting new possibilities for shattering objects in destruction sims. In the demo above, Boolean shattering produces much more subtle results than standard Voronoi shattering, with shatter patterns reflecting the underlying material: the breakage of the beams is different from the wall. Since Boolean shattering is also driven directly by a source mesh, the shatter pattern is also more art-directable than with parametric methods like Voronoi shattering. The shading system has also been overhauled in a way “intended to feel familiar to users of other software”. “We’ve simplifed shader building so it works entirely at the VOP [VEX OPerator] level,” said Barghiel. Light absorption and dispersion are now built into all of Houdini’s shading models, including that of the new ubershader, which is based on the PxrDisney shader introduced in Houdini 15.5. Related changes include a new subsurface scattering scattering system, and support for nested dielectrics, making it easier to shade nested transparent materials: for example, liquid in a bottle. 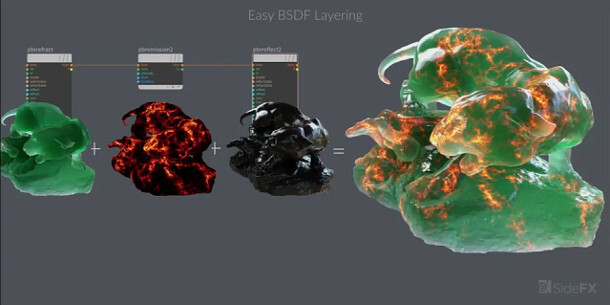 Shader modules have been rearchitected with layering in mind, with a new “easy BSDF layering” system that handles energy conservation of materials automatically. Viewport rendering has also been updated, with real-time displacement and “much better” support for transparency, giving a much more accurate representation of shaders within the viewport. According to Side Effects, the representation isn’t 100% faithful to the final render, but should be good enough to make it possible to do serious look development work in Houdini. There is also a neat new option to click on any pixel in the IPR and reveal the material style sheet generating it, making it easier to troubleshoot problem scenes. 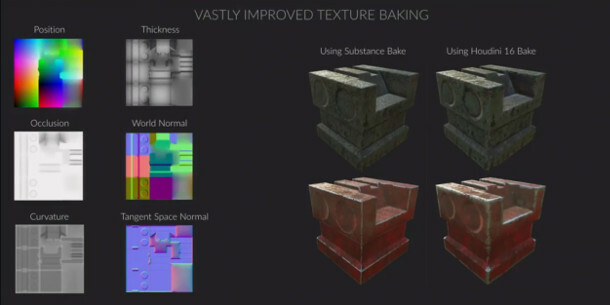 Texture baking has also been “vastly improved”. Side Effects didn’t go into much detail at the launch, but noted that the system is compatible with standard game art tools like Allegorithmic’s Substance software. The update also overhauls the software’s rigging tools, with Side Effects commenting that it hopes that the changes will make rigging characters in Houdini a “much more common occurrence”. At its simplest, that means a number of basic workflow tweaks, which you can see at 03:35 in the video. More significantly, there is a new autorigging system for automatically generating a skeletal rig to fit a source character mesh: initially, only bipeds, although quadruped rigs are “imminent”. The resulting rigs support features like squash and stretch, and the system, which has been written entirely in Python, is fully modular, enabling artists to create and swap in their own custom body parts. There is also a new muscle system, which enables artists to draw in the position of muscles within a character and have them animated automatically, with controls for shape, depth and rigidity. 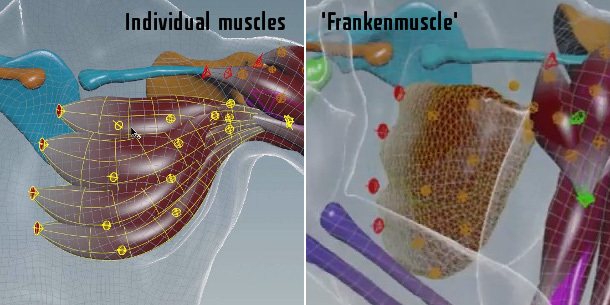 Muscles can be based either on springs or the FEM solver introduced in Houdini 13, with the option to collapse groups of individual muscles into FEM tetrahedral meshes, or ‘Frankenmuscles’, as shown above. 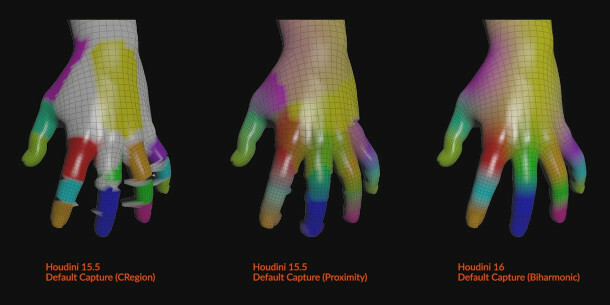 The update also introduces a new biharmonic capturing system for calculating skin weighting, shown in the image above, intended to generate fewer artefacts that the default algorithms in Houdini 15. On top of that, there is a new system of ‘invisible rigs’, which enables users to assign attributes to selected parts of the character mesh, then link those attributes to rig controls. The system makes it possible to pose characters by manipulating them directly in the viewport, rather than manipulating them via the controls. For TDs, there are a number of changes to Houdini’s simulation toolsets, including fluid simulation. Several seem targeted at the kind of smaller-scale sims commonly seen in commercials – and for which RealFlow is currently the de facto solution – rather than large-scale movie effects. Those include the new, physically correct surface tension system, which makes it possible to create convincing macro shots, like crown splashes. There is also a new ‘suction fluid’ system, which draws fluid upwards to fill a target mesh: a static mesh, as in the rather commercial-like test scene above, or even an animation cache. In the launch event, that meant an impressive demo of crowd characters wading through a river and drawing the water up inside themselves to create “sloshing, zombie-like” figures. Viscous fluid simulation has been updated, with “much better” interpolation of collisions and the option to create a ‘slip field’ which determines how slippery a surface is with respect to the fluid. There is also a new option to upres FLIP fluid simulations to add detail where necessary, blending the resulting low-res and high-res sections of fluid automatically. 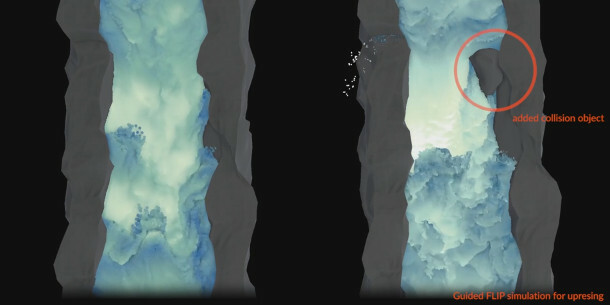 Above, you can see the system in action to add a new collision object to a river: according to Side Effects, there are 2 million particles in the original sim, and 12 million in the upresed slice. The same technology is also used in the new ocean simulation system: another major feature of the update. The system makes it possible to layer wave spectra as SOP (Surface OPerator) networks, rather than by baking them as textures and blending them in a shader, helping to minimise tiling artefacts. Surfaces with different wave spectra can be masked out and blended together, or surfaces blended with guide simulations, making it easier to simulate, say, an object breaking through the water surface. The move to a point-cloud-based approach also means that ocean surfaces can be applied to arbitrary geometry, as in the shot above of an ocean surface warped into a spiral. 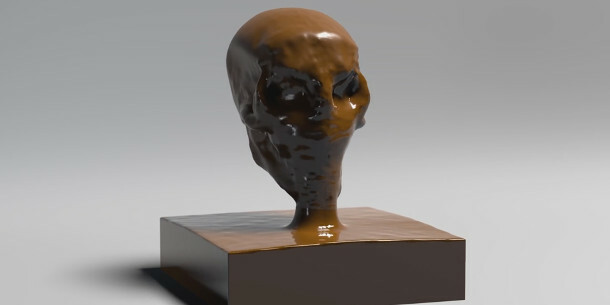 Other changes to the simulation tools include a new system for generating surface wrinkles when using the FEM solver, generating more convincing-looking rubbery and organic materials. 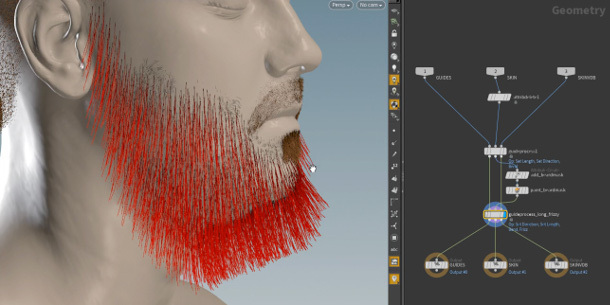 The grooming tools for hair and fur simulations have also been overhauled: the old fur procedural has been removed in favour of a new system entirely based on SOPs. 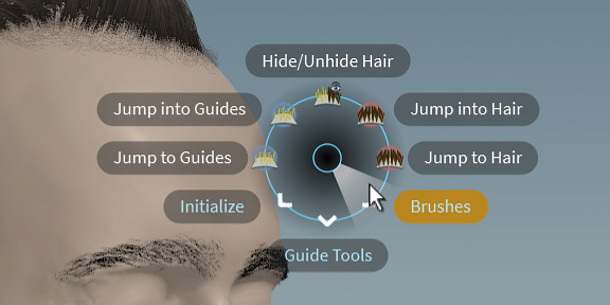 As well as enabling artists to switch more freely between grooming and simulation while setting up a shot, Side Effects says that the new system makes hair behave more predictably even in “crazy” situations, and makes dynamics more aware of hair clumping. But perhaps the biggest new feature unveiled at the launch event is the new heightfield terrain system. Again, it’s based on SOPs, meaning that terrains are fully procedural: according to Side Effects, it’s possible to work with a low-res heightfield during look dev, then swap it for a high-res version at render time. 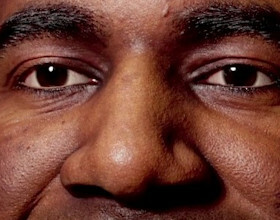 It’s also possible to blend different sources of heightfields – including source meshes: the demo showed a pig’s head being used as part of a terrain, Mount Rushmore-style – making the results highly art-directable. The resulting terrain can be used as a collision object with most, if not all, Houdini simulation types, including rigid bodies, FLIP fluids, particles and Pyro FX, FEM simulations, and crowds. 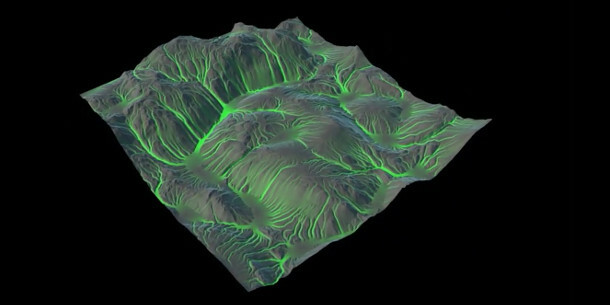 In particular, there is a new erosion simulation type, which can be used to simulate where water collects on a terrain, or how it weathers the underlying landscape, as shown above. According to Side Effects, the terrain system has been developed with the needs of games artists in mind, and plays nicely with standard game tools: one demo showed a Houdini terrain exported to Unreal Engine, and integrated with assets created in SpeedTree, Quixel and the Substance tools. There are also a lot of smaller features, which you can see in a scrolling list at 05:20 in the video. One underlying theme is the focus on games work, including “enhanced” Unity and Unreal Engine 4 plugins; another is OpenCL-based GPU acceleration, which has been greatly extended in the update. However, there are also several key changes related to VFX pipelines, including support for the OpenColorIO colour-management standard, and import of LIDAR data in E57, LAS and LAZ formats. Updated 22 February: Houdini 16 is now shipping for Windows, Linux and Mac OS X on 21 February 2017. Houdini FX, the full edition of the software, costs $4,495 for a node-locked licence or $6,995 for a floating licence. The MSRP of the simulation toolset-free base edition – now rebranded ‘Houdini Core‘ – remains unchanged at $1,995 for a node-locked licence, and $2,995 for a floating licence. However, Side Effects is offering floating Houdini Core licences at a launch discount of $1,495 until 31 May. The free non-commercial Apprentice Edition and $199/year Indie licence are still available, and the other rental prices for the software have been reduced. Errata: an early version of this story quoted Cristin Barghiel as saying that the new shading system worked entirely through shader operators rather than VOPs. This has now been corrected. The story also referred to the price of floating licences of Houdini rising. Side Effects has been in touch to say that this isn’t actually the case: it’s just that they didn’t previously quote the price of floating licences publicly, so the old figures on their website were for node-locked licences only.